This is a old beautiful bridge with much history. The city is filled with stories and beauty. A nice afternoon experience. 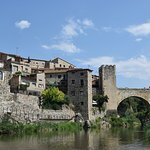 Walking through the Bridge of Besalú is just like you are going back to the future. This is a town from 12 century which still in good shape. The Bridge of Besalú is cross over the Fluvia River with the city gate right at the middle of the bridge. Just watching the people fishing along the Fluvia river bank is a true treasure. The narrow street from the bridge will lead you into the town. 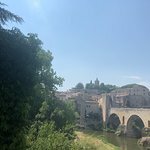 You will never get lost in Besalú , there are so many interesting place to see; Sant Pere, the old church from 1003 AC , the Mikveh near the river is also interesting, or you just sit back in a side walk cafe with a cold drink is also a good idea. 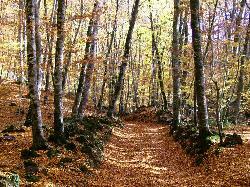 To sum up thing, you shouldn’t miss to visit Besalú if you are in the area. 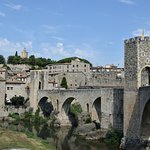 This is one of the main attractions in the quaint medieval town of Besalu, and really feels like you're stepping back in time as you walk across. That being said, it is just a bridge - as long as that's your expectation, definitely worth a visit. This is a great little town. Lots of day trippers, but in the evenings it's so quiet...Cute shops open during the day, and a few, really good restaurants open in the evenings. We tagged on to a cruise ship’s half day excursion to see this. The bridge is a good vantage point but some of the old town walls have been somewhat less than sympathetically restored - breeze block sections - seriously? What should have been a pretty good photo op of the river below was ruined by a fisherman’s 4x4. Why any vehicle would be allowed down there beats me. There’s a little train that apparently ferries tourists around though not sure exactly where it goes. The old town’s worth a wander for an hour or so - some traditional provision stores and a few cafes and bars. I’m not well traveled in Spain but I’d be very surprised if there weren’t more impressive medieval structures/towns than this in the country. There certainly are elsewhere. 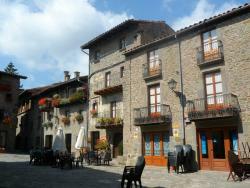 Besalu is a lovely medievial town making for a welcome change from the beach. Plenty of shops for souvenir shopping and plenty of choices for a nice little lunch.